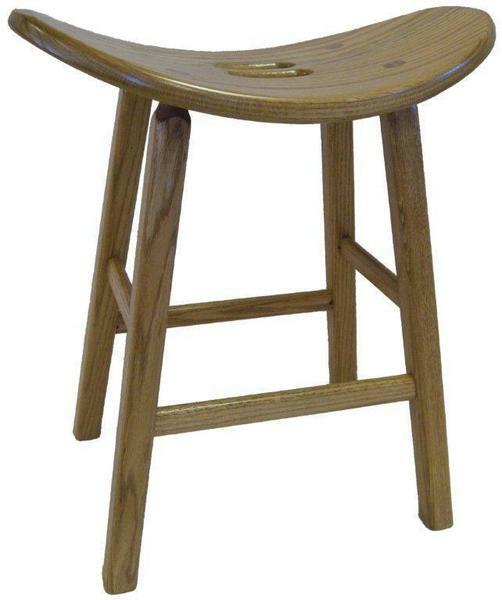 Your family and guests will enjoy saddling up to this comfortable stool. Creating a fun atmosphere for your kitchen or bar area, the hardest part will be deciding who gets to make use of this special seat! As you can tell by the photos of our Amish Kitchen Saddle Stool with Square Leg, the possibilities for this stool are many. Enjoy it in the bathroom as an extra surface or chair for your vanity. This saddle stool also works great in the entryway for a seat to make use of while putting on your shoes. The cutouts in the top of this stool make it easy to move around, which you most certainly will be doing! The saddle stool has a purpose in every room of your home. We'd love to speak with you about the possibilities for this piece, so please feel free to get in touch by calling 866-262-6773.